This meeting is held in the J. David Williamson Board Room at the Administrative & Instructional Complex. This meeting is held in the Cabinet Room at the Administrative & Instructional Complex. This meeting is held in the Cabinet Room at the Robert R. Freeman Administrative Complex. 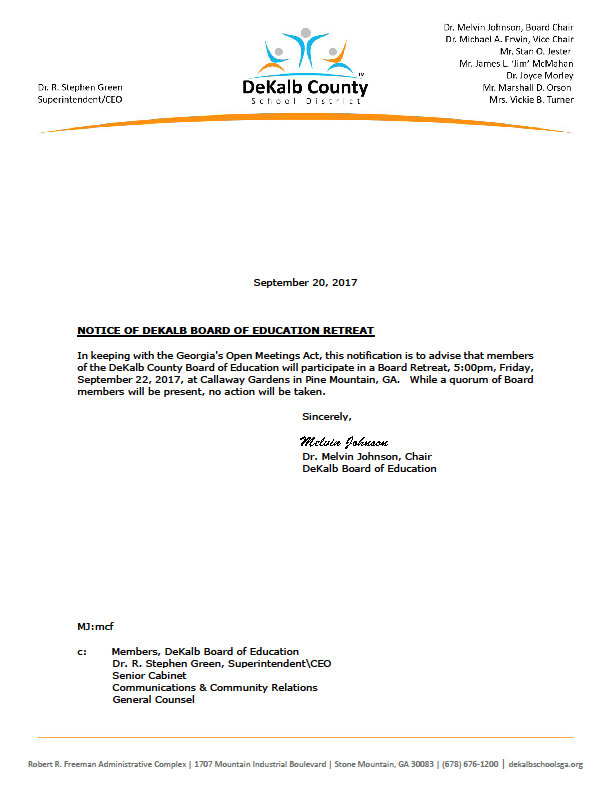 This meeting will follow the Board of Education’s Executive Session being held at 1:15pm in the Cabinet Room/Board Office Conference Room. This meeting is held in the Decatur Room at the Robert R. Freeman Administrative Complex. This meeting is held in theJ. David Williamson Board Room at the Robert R. Freeman Administrative Complex. This meeting is held in the Cabinet Room at the Administrative & Instructional Complex.. For more info, visit the Board of Education homepage. All Work Session begin at 2:00pm (unless noticed for some other time), and will be held in the Cabinet Room, in the Robert R. Freeman Administrative Complex, 1701 Mountain Industrial Boulevard, Stone Mountain, Georgia. The meeting agenda can be found here. 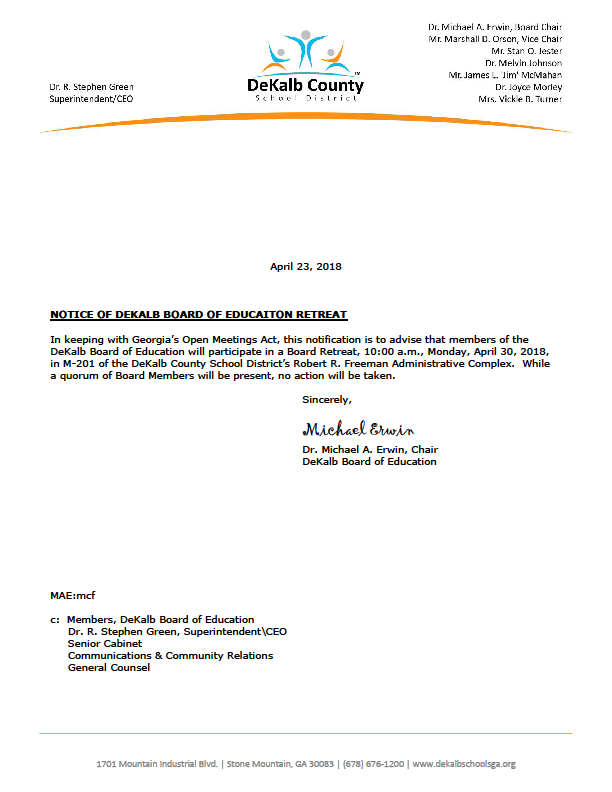 This meeting will be held in the J. David Williamson Board Room in the Robert R. Freeman Administrative Complex, 1701 Mountain Industrial Boulevard, Stone Mountain, Georgia. The meeting agenda can be found here. All Business Meetings begin at 7:00pm, and will be held in the J. David Williamson Board Room in the Robert R. Freeman Administrative Complex, 1701 Mountain Industrial Boulevard, Stone Mountain, Georgia. The meeting agenda can be found here. 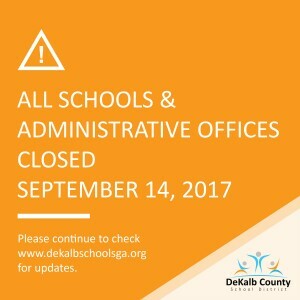 The DeKalb Board of Education will hold a series of budget and millage rate hearings that are open to the public. If you would like to speak at any of the following hearings, sign-up is on a first come, first serve basis on the day of the hearing, one hour prior to the hearing. 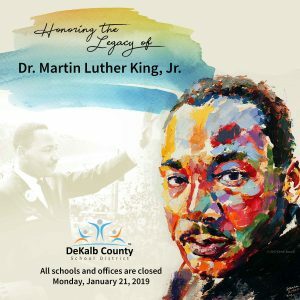 The DeKalb Board of Education will hold a final millage rate hearing, followed by a called meeting for the adoption of the 2019 budget and tax levy. These hearings are open to the public. 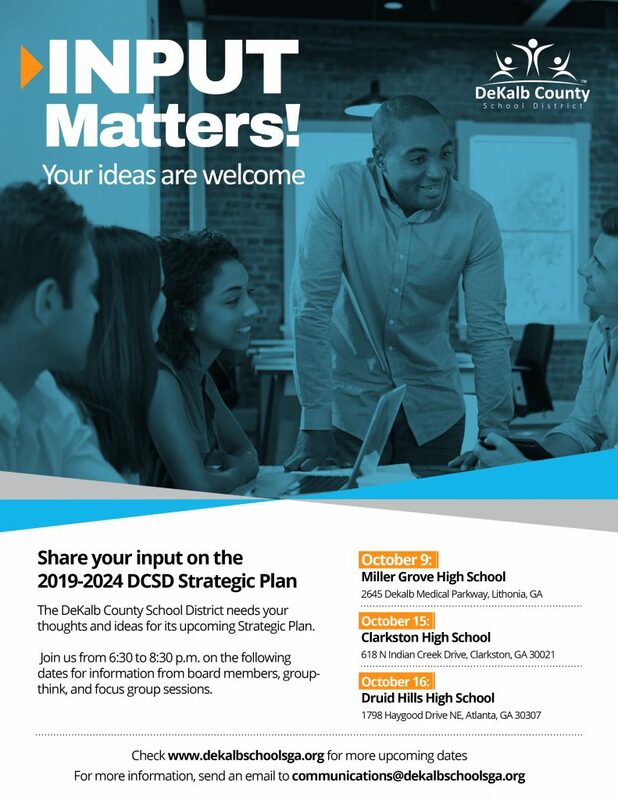 If you would like to speak at the final millage rate hearing, sign-up is on a first come, first serve basis on the day of the hearing, one hour prior to the hearing. The DeKalb Board of Education will hold a called meeting for the adoption of the 2019 budget and tax levy. This meeting is open to the public.